16th May 2016, Jakarta, Indonesia – PanaHome Asia Pacific Pte. Ltd. (PHAP), a wholly-owned subsidiary of PanaHome Corporation, together with PT. Gobel International (GI) signed an agreement today to establish PT. PanaHome Gobel Indonesia (PHGI), a new company focused on rolling out housing technologies and solutions in the local market. This is the Group’s second presence in Southeast Asia. PanaHome, the housing subsidiary of global electronics giant, Panasonic, has built a total of about 470,000 residences in Japan over the past 50 years. It has expanded its business overseas, to Taiwan in 2010, and Malaysia in 2012. In April 2015, it established PanaHome Asia Pacific to strengthen its foothold in the housing industry across Southeast Asia and Oceania. PanaHome Asia Pacific will oversee business development and utilise the Group’s 50-year experience to provide better quality houses, equipped with smart solutions and sold at reasonable price, by engaging in construction (building framework), and interior furnishing and layout planning for homes, while GI will play an advisory role given its knowledge in local housing market trends and demands, as well as vast partner network. PHAP holds 75% share in PT. PanaHome Gobel Indonesia and the other 25% belongs to GI. PHGI will promote property development projects by establishing Special Purpose Company (SPC) with selected local developers. The company will also focus on township development utilising our known-how in Japan and replicating the success of projects such as Fujisawa Sustainable Smart Town and Smart City Shioashiya. The PanaHome Group targets 50 billion Japanese Yen in overseas sales by fiscal year ending March 2019. This includes Taiwan, Malaysia, Indonesia, Thailand, Vietnam and Myanmar. PHGI is a stock company owned by PHAP and GI. As with PHAP, PHGI will be operated under PanaHome’s Overseas Business Headquarters. 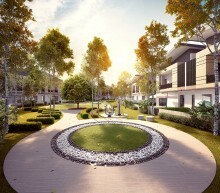 PHGI’s planned establishment is intended to strengthen PanaHome’s corporate function as a housing developer. Established in 1963, PanaHome Corporation traces its roots back to the passionate vision of Konosuke Matsushita, founder of Panasonic Corporation, who believed in building quality houses to better people’s lives. As the housing subsidiary of the Panasonic Group, PanaHome recorded consolidated net sales of 353 billion yen for the year ended 31 March 2016. PanaHome has built a total of about 470,000 residences in Japan over the past 50 years. It has expanded its business overseas, to Taiwan in 2010, and Malaysia in 2012. In April 2015, it established PanaHome Asia Pacific Pte. Ltd. to strengthen its foothold in the housing industry across the Southeast Asia and Oceania region.